A simple explanation convines a young man to dedicate himself to a life centred around chanting the names of and serving God. Then, four years later (in my junior year of high school) , a close friend laughed at my ideas. “The wonders of nature are just coincidences. You’re just imagining that a God is doing these things.” His strong personality and arguments persuaded me to set aside my belief for the time being. Dismayed at not being able to find any peace of mind, I turned to the East for spiritual wisdom and looked for a spiritual teacher. For a start, I read about Zen Buddhism and also attended a weekend meditation led by a well known American Zen master. What an experience that was. All of us had to sit straight and stiff and play all kinds of mental games to empty our minds. We had to meditate on riddles like, “What is the sound of one hand clapping!” At times} when I fell asleep, a monitor would swat me on the shoulder with a stick. Needless to say, I felt uncomfortable. After the meditation, someone asked the master about Vedanta philosophy. He replied, “I have enough trouble keeping up with Zen. How can I think about Vedanta?” It seemed to me that a real spiritual teacher should know everything about spiritual life. So right then I knew that this man wasn’t the teacher I was looking for. Later, I studied the writings of a famous Indian whom many people had called an incarnation of God. I asked one of my friends how I could study under him, but my friend told me that he didn’t accept any students. I thought, “What kind of master is this? Without accepting students, how can he benefit anyone? So that he can be detached he’s denying others the opportunity to be enlightened?” This didn’t make much sense to me, so I gave upon him. Next, I became interested in a group that offered a popular version of meditation. Their leading American representative had rented a big hall in Cambridge to demonstrate the technique. But when I went there I found out that I’d have to pay an initiation fee of thirty five dollars and give up some kind of sense pleasure for one week. I wondered, “Thirty five dollars this is spiritual life? And if sense pleasure is bad, then why give it up for only one week?” It all sounded a little strange. So it went. Whenever I found that a “swami” or “yogi” or “perfect master” or “realized soul” was anywhere within a thousand miles, I would rush to meet him. 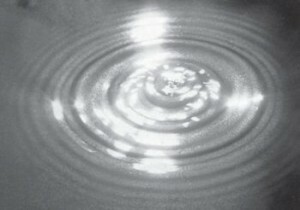 ‘”This ananda,” “That ananda” -so many anandas I met, but I always came away disgusted. When one of my classmates and I entered the hall, the lecture had just ended. We saw Srila Prabhupada sitting on a magnificent chair in the middle of the stage.He was surrounded by chanting and dancing devotees. Satsvarupa Dasa, (now Satsvarupa Goswami) the president of Boston’s Krishna temple, led the enthusiastic chanting. As the sound system boomed the transcendental vibrations off the bare brick walls, I felt like jumping up and joining in. When the chanting ended, the devotees bowed to offer their respects to Srila Prabhupada. Then he left the stage, and a few disciples followed him. A devotee commented, “Sure, this world is like a movie. But when you’re watching a movie, you know that there’s someone behind the whole show: a projectionist. So there’s also someone behind this world Krishna.” The more I listened to the devotees, the more I wanted to hear their guru. When Idropped them off in Harvard Square I asked a devotee named Patita pavana where the temple was. He told me how to find it and said that Srila Prabhupada would be speaking there the next evening. I decided to go. I spent the next day anticipating my visit to the Krishna temple. Finally, about 6 p.m., I set out. The temple was in an out of the way but pleasant part of Boston called Allston. At the given address, 95 Glenville Avenue, I found a small storefront. With anxiety and eagerness I rang the doorbell, and a pleasant young man opened the door and welcomed me in. The room was thick with the smoke and fragrance of incense. It was a smallish room, crowded and warm. I saw Srila Prabhupada seated on the same chair as at the auditorium on campus. He was speaking, but I could hardly hear him. Yet I did catch one thing he said. He quoted a verse from the Bhagavad gita: “Out of many thousands among men, one may endeavor for perfection, and of those who have achieved perfection, hardly one knows Me in truth” (Bg. 7.3). I hesitated. I had some inclination to serve God, but I admitted, “Actually, I see that I wanted to become God. After everyone else had begun eating, I sat down and looked at my plate. There were so many preparations that I’d never seen before; I didn’t know which one to try first. I bit into a pakora (a breaded cauliflower chunk, zestfully spiced and deep fried in pure butter). In all my life I had never tasted food so delicious. I looked at the devotees around me relishing their prasada, and then I tried a puri (a light pastry, puffed in pure butter) and some eggplant and tomato with curd. Again the taste was extraordinary. One by one I tasted all the preparations, and each one was more wonderful than the last. I’d never experienced such pleasure in eating. I reflected that everything in Krishna consciousness was that way. The philosophy, the prasada, the chanting, the temple, the devotees, and their spiritual master all were on a superior level. After the questions and answers, with Srila Prabhupada looking on, the devotees danced in a circle and chanted Hare Krishna. When I joined them I began to sense that Lord Krishna actually is present, as He says in Bhagavad gita, “within the hearts of all living beings.” It was a bright moment in my spiritual life. After the question and answer period, the devotees chanted Hare Krishna. Later, I lingered among the audience, noting how they’d appreciated Srila Prabhupada and the chanting of the Hare Krishna mantra. A disciple told me what I’d already gathered: Krishna’s pure devotee can never be defeated. Although I was still living at my apartment, I liked the idea of working with Prabhupada’s disciples. But I was in doubt about whether I should move into the temple or stay where I was. One night, I got th e opportunity to drive Srila Prabhupada back to the temple after his lecture. Here was the chance to ask him something that had been on my mind for some time. “Srila Prabhupada, what should I do with the rest of my life?” I was anxious, because I expected that he would ask me to move into the temple right away. But he replied, “Just study our books very thoroughly and chant Hare Krishna.” I was relieved that Srila Prabhupada was so understanding. He’d already helped me to see that Krishna is the center of things, and I could see that the rest would come naturally. At the end of 1970, Giriraja Swami went along on Srila Prabhupada’s well received return tour of India. 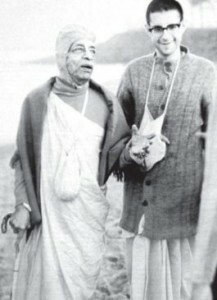 Later, while he was the president of ISKCON’s Mumbai branch, among his other responsibilities, Giriraja Swami helped coordinate the Indian affairs of the Bhaktivedanta Book Trust and ISKCON’s life membership program. After that he extensively preached all over the world and now lives in the USA.